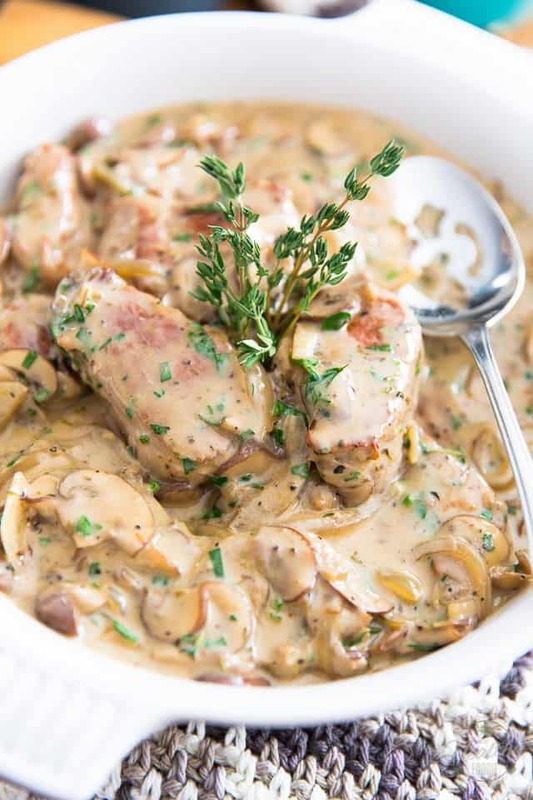 Ready in under 20 minutes, this Pork Tenderloin in Creamy Mushroom Sauce is perfect for any night of the week, yet is so good that it’s totally worthy of being served on any special occasion! 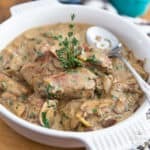 I’ve said it many times, pork tenderloin has to be one of my top favorite meats to have in the fridge or freezer: it’s so versatile, naturally tasty and easy to prepare, you can turn it into a veritable feast even if you have close to nothing in the fridge, or just about no time on your hands! It’s the perfect option for those busy weeknight dinners, but will just as well fit the bill when circumstances require a bit more elegance, sophistication and flair! And once you’ve tasted it for yourselves, I think that you’ll have no trouble agreeing with me on this one! 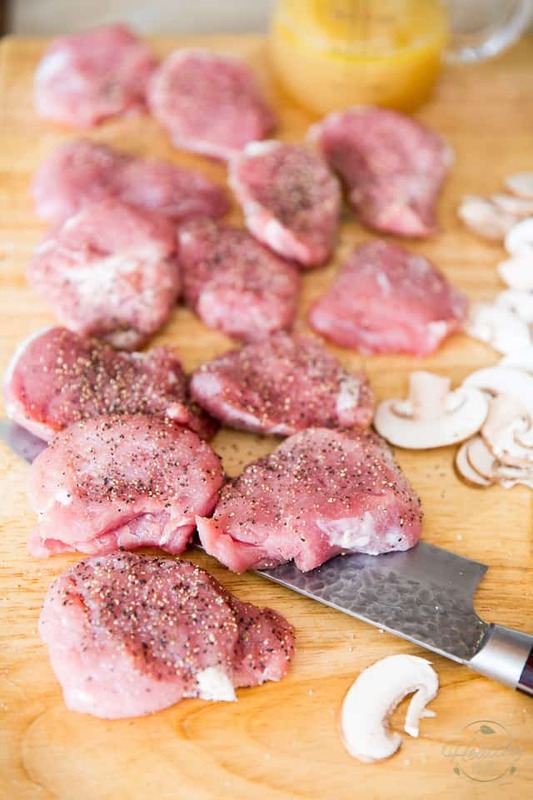 To start, you’ll need to slice your pork tenderloin (or tenderloins, depending on its/their size — you want to have around 1-1/2 pound of meat in total) into approximately 2″ thick medallions. Then, flatten each medallion slightly with the palm of your hand; season both sides with salt and pepper. 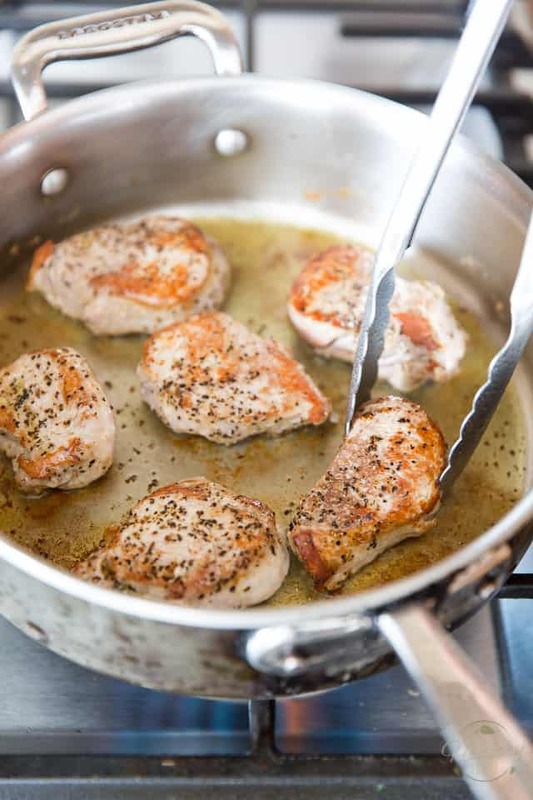 Heat a few tablespoons of olive oil (or your favorite cooking oil) in a saute pan set over medium heat; When the pan is hot enough, add the pork medallions, 5 or 6 at a time, and cook them 2 to 3 minutes per side, until golden brown. Remove to a plate and repeat with the remaining meat; reserve. 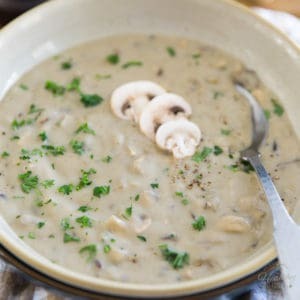 Now return the pan to the heat source and to it, add a thinly sliced onion, a few cloves of garlic and loads of thinly sliced mushrooms (I used baby bella but white mushrooms would work just as well) and cook, stirring often, until the vegetables are tender and fragrant, about 5 minutes. Next, add the chicken broth, salt, pepper and herbes de Provence, stir well and bring to a simmer. Meanwhile, combine half a cup of white wine (or more chicken broth, if you’d rather not add any alcohol to your dish), half a cup of sour cream (sub plain yogurt if you prefer that) and a tablespoon of corn starch together in a small measuring cup and whisk until well combined; add that to the pan and stir well. 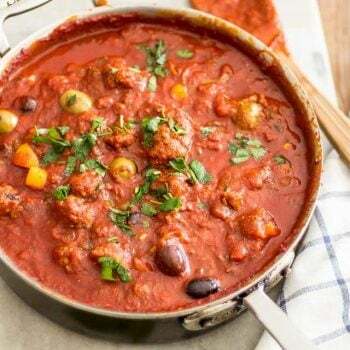 Return the medallions, along with their cooking juices, back to the pan; stir well and simmer for about a minute until the sauce thickens, then kill the heat. 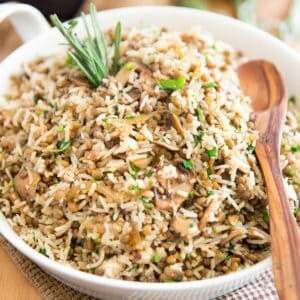 Allow the meat to sit in the sauce for a few minutes then stir in a generous handful of chopped parsley and serve. 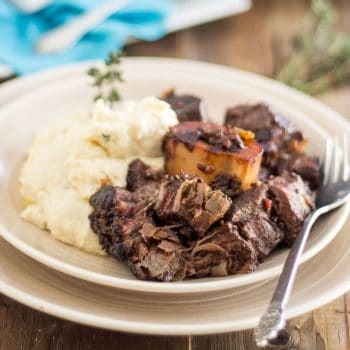 This dish would be fantastic served over cooked pasta, or mashed potatoes, or mashed cauliflower… or even just alongside a simple green salad, or sauteed veggies! 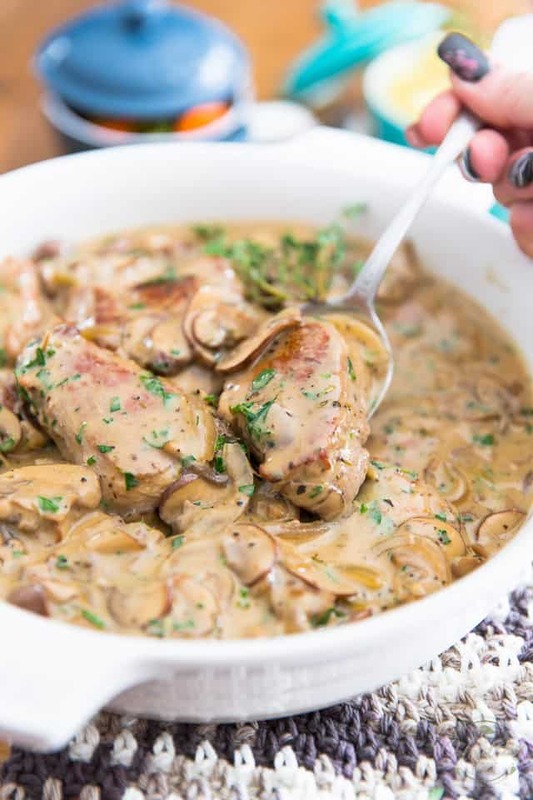 Ready in under 20 minutes, this Pork Tenderloin in Creamy Mushroom Sauce is perfect for any night of the week, yet is so good that it's totally worthy of being served on any special occasion! 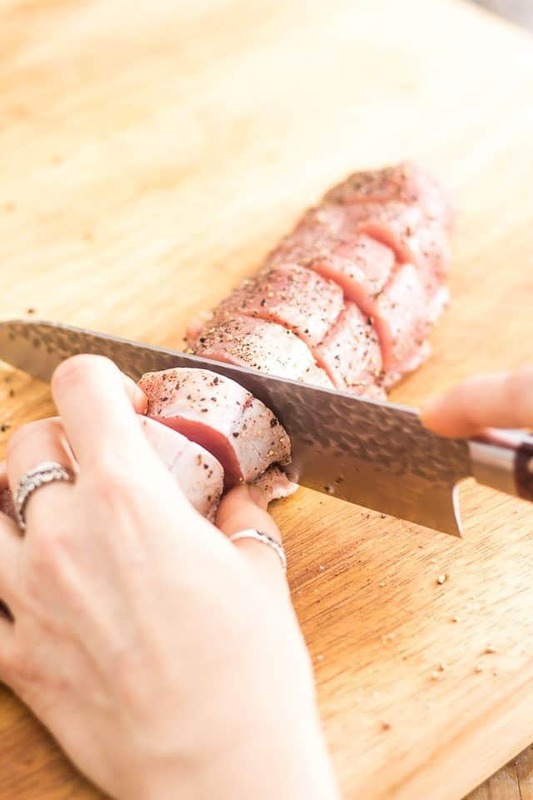 Cut the pork tenderloin(s) into 2" thick medallions and then flatten each medallion slightly with the palm of your hand; season both sides with salt and pepper. 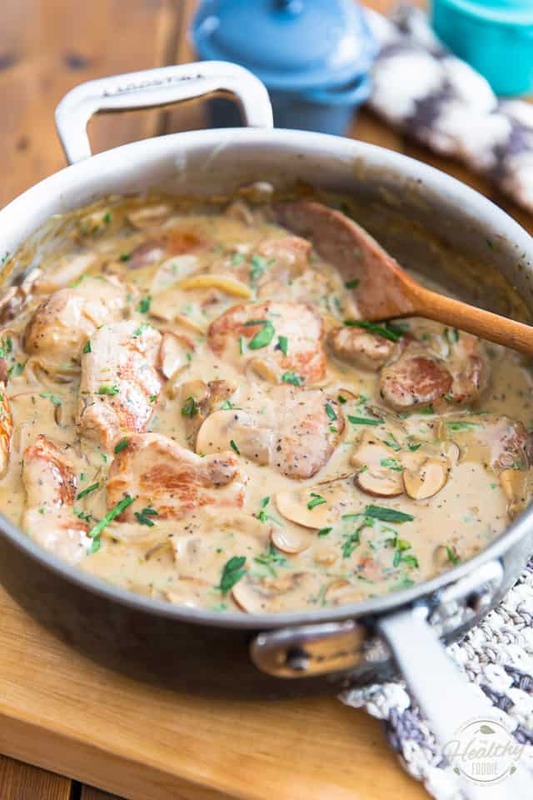 Heat a few tablespoons of olive oil in a saute pan set over medium heat; When the pan is hot enough, add the pork medallions, 5 or 6 at a time, and cook them 2 to 3 minutes per side, until golden brown. Remove to a plate and repeat with the remaining meat; reserve. 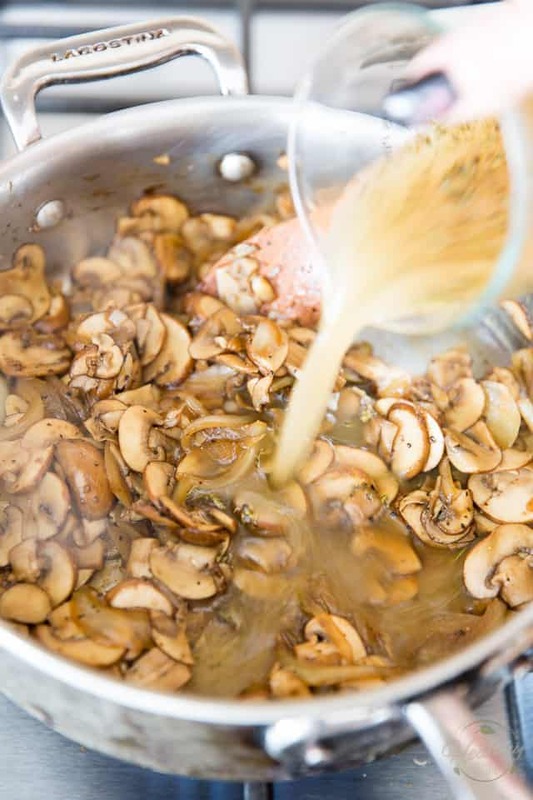 Return the pan to the heat source and to it, add the sliced onion, garlic and mushrooms and cook, stirring often, until the vegetables are tender and fragrant, about 5 minutes. 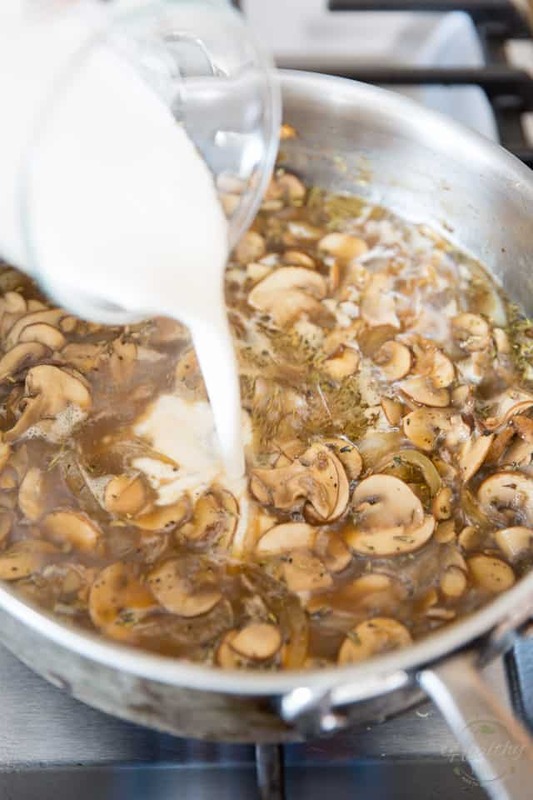 Add the chicken stock, salt, pepper and herbes de Provence, stir well and bring to a simmer. Meanwhile, combine the white wine, sour cream and cornstarch together in a small measuring cup and whisk until well combined; add that to the pan and stir well. Return the medallions, along with their cooking juices, back into the pan; stir well and simmer for about a minute until the sauce thickens, then kill the heat. Kill the heat and allow the meat to sit in the sauce for a few minutes, then stir in the chopped parsley and serve. 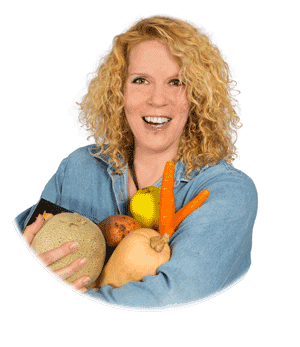 I cooked it right away – super lecker! Looks delicious. Love the idea of the mushrooms. I will definitely try! Cooked this the other night for DH, delish! I will be making it again for friends next week. Thanks for the recipe. It will be included in rotation. Cooks up so easy. 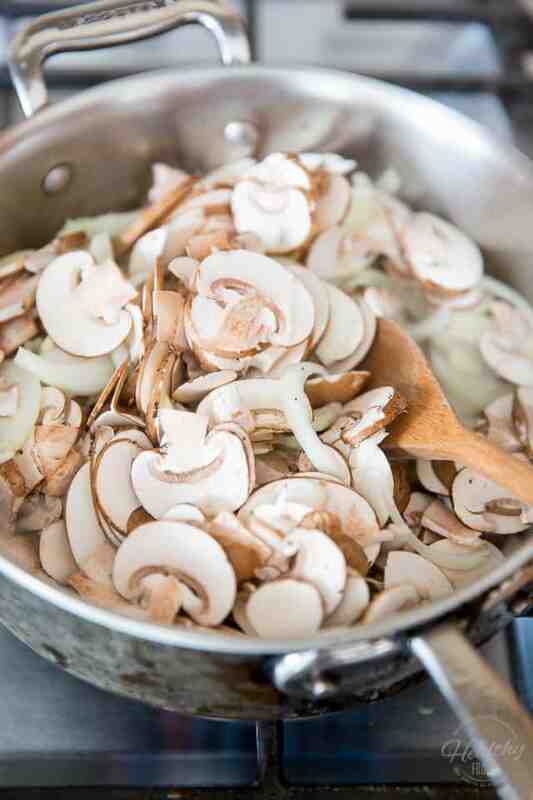 Basic ingredients, basic method, great dish. I tried this tonight. 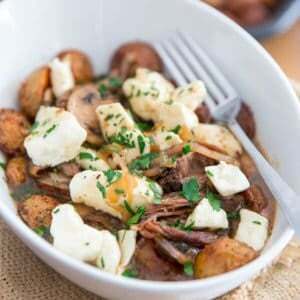 Found the recipe through Google- entered pork, mushroom & cream recipes & this came up. I had a little pepper mishap (fumbled with it & dumped too much in!) but my husband loved it! Delicious!! Thanks for sharing! 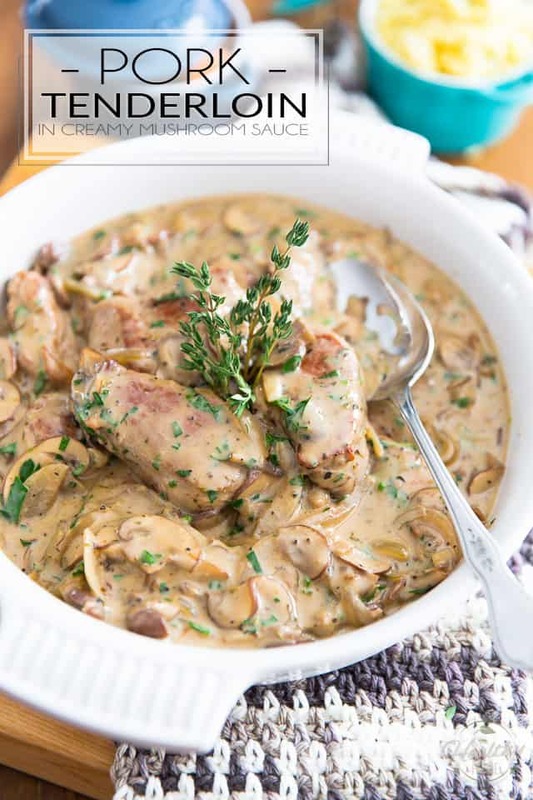 Going to try this tonight.. no sour cream in the fridge so am coming to try heavy cream..
Love this recipe! Only substitution was a large shallot instead of onion, which was a delicious sub. I had leftover pork tenderloin from another meal so just sliced it think and added to the sauce. Perfect! I will try this sauce again with a ground turkey and serve over egg noodles. 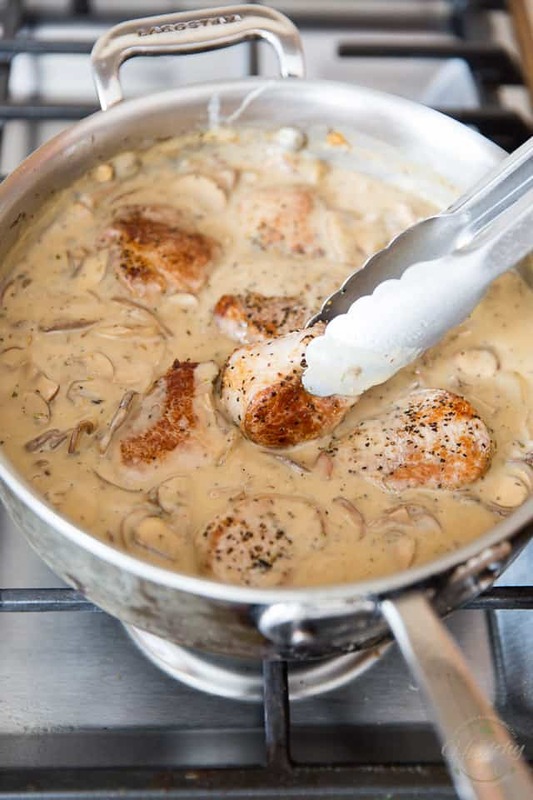 Mock stroganoff. Thank you! Real happy to hear, Jennifer! And thanks much for your kind review! The vegetable stock must contain some salt so will try without adding salt as seasoning next time. 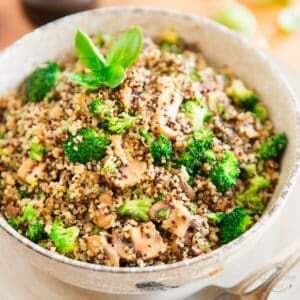 Beautiful recipe!!! 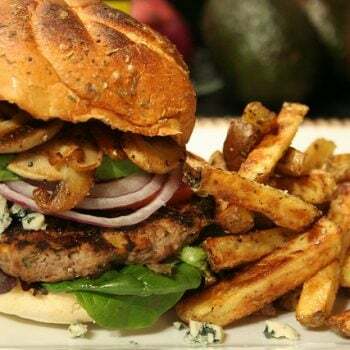 Delicious rich flavors, easy to make. Served with mashed sweet potatoes and asparagus. Wine J. Lohr Chardonnay. Tried so many variations of this and have to say this one comes out tops. I’ve made this a few times now. It always turns out delicious! Making it again tonight for meal prep for work, thanks for the recipe! 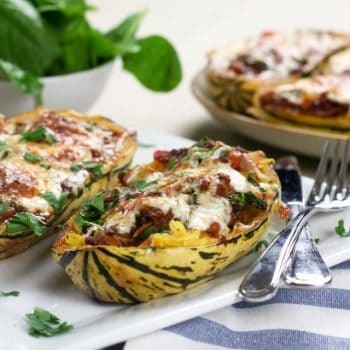 Perfect dish…quick and easy … with pasta, polenta, gnocchi… chicken version is also delicious… with cold white wine and green leaves salad as a side dish… yummi!